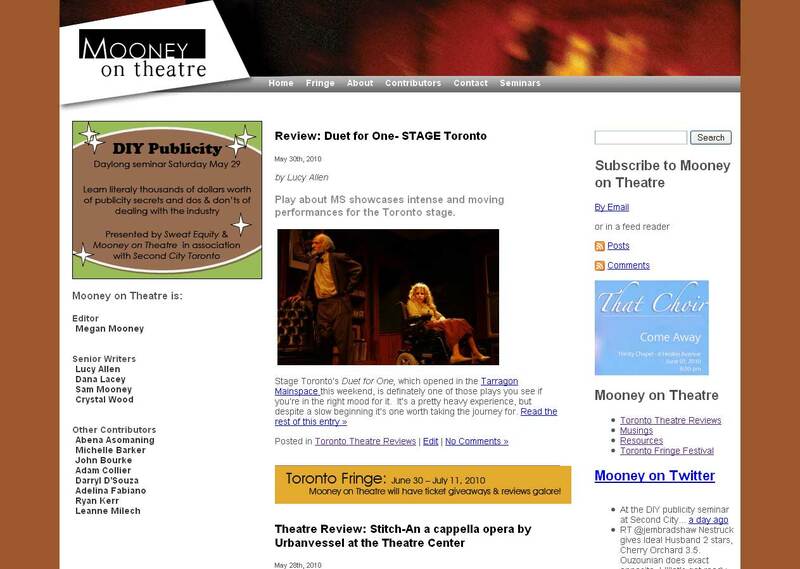 During the 2010 Toronto Fringe festival – and for 9 days before and 6 days after – Mooney on Theatre will be displaying ads targeted directly at Fringe attendees from businesses and organizations located near Fringe venues. 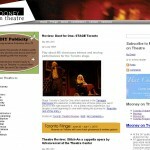 Download the Mooney on Theatre Media Kit (.pdf) or keep reading. Why advertise on Mooney on Theatre? During the 12 days of Fringe (June 30 to July 11) we receive 3500 page views per day – 40,000 in the 12 days. These are all from people who are going to Fringe. They check the site for reviews, previews, and contests. For those 12 days Mooney on Theatre is all about the Toronto Fringe Festival. People are going to be going from venue to venue with time to spare between shows. They might as well spend that time with you. Tell them who you are with an ad on Mooney on Theatre. Choose from three highly visible ad placements. You can click on the image for a full size picture showing the placements of ads. Premium Rectangle – There are 4 premium rectangle spots available. The ads will rotate and each will be seen 10,000 times. In addition to the premium ad placement we will write a sponsored post about your business. We also include your business on our map of Fringe venues and in our post thanking our sponsors. There are 8 rectangle spots available. The ads will rotate and each will be seen 5,000 times. We will include your business on our map of Fringe venues and in our post thanking our sponsors. There are 16 banner spots available. The ads will rotate and each will be seen 2,500 times. 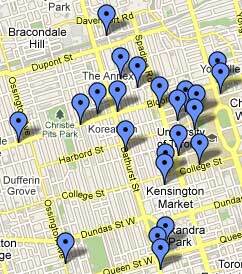 We will include your business on our map of Fringe venues and in our post thanking our sponsors. Ads can be .jpg or .gif format – if you don’t already have a web-ready ad read the Extra Services section at the end. Ads should link to your website – if you don’t have a website read the Extra Services section at the end. You can have your ad run either June 21st to July 17, or June 28 to July 24. Website -Through an arrangement with for the love of work we can offer a one page website at a very special price.